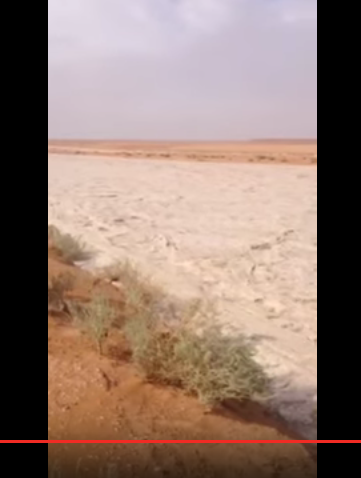 There is a video that has gone viral on internet that showing a rare weather phenomenon that brought rain and hail storms to an otherwise hot and dry area in Iraq, and caused a river of frozen water to stream through the desert. The video footage shows a river of hail running in the middle of a desert following a storm on November 16, 2015. and has now been named as the 'sand river'. As per the online reports, heavy rains over the past few weeks triggered floods that killed a few of people in Iraq and caused widespread damage in neighboring countries of Egypt, Israel, Jordan and Saudi Arabia. And although in the video it looks like sand flowing like a river, it is actually hailstones and this shows that a heavy rain had pounded upstream dropping a lot of hailstones.